This article is about the objects from the Mario franchise that fire projectiles. For other uses of the term "cannon", see Cannon (disambiguation). Artwork of a Cannon from Super Mario Run. Cannons are used to fire all kinds of projectiles in the Mario franchise, including characters. They have a more generic appearance and use than the Bill Blasters which specifically shoot out only Bullet Bills. Cannons are usually part of the environment and cannot be destroyed. 1.3.1 Mario vs. Donkey Kong 2: March of the Minis/Mario vs. Donkey Kong: Minis March Again! 1.3.2 Mario vs. Donkey Kong: Mini-Land Mayhem! Cannons on the ground in Super Mario Bros. 3 (both NES and Super Mario All-Stars). Cannons make their first appearance in Super Mario Bros. 3 in the airship levels. Unlike Bill Blasters, which shoot Bullet Bills straight ahead, fixed cannons shoot their cannonballs diagonally. They are found on floors and ceilings and continue firing when touched. There are also rotating versions of the cannons, which fire in two directions at a time, then rotate at a 45° angle. There are also mortars that eject Bob-ombs at short distances. Mario aiming with a cannon in Super Mario 64. Cannons, this time colored blue, are a vital gameplay element in Super Mario 64 and Super Mario 64 DS. There is at least one cannon found in ten levels in these games, as well as one secret stage. 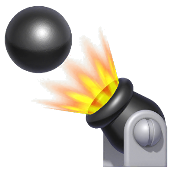 Each of the cannons that can be found throughout the games are under the control of Bob-omb Buddies. 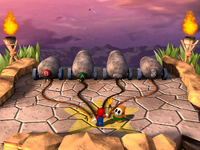 The player must successfully locate and talk to the Bob-omb Buddies in each level in order to access the cannon or cannons for that particular level. Until they do, the cannons remain covered by a metal hatch with a picture of a Bob-omb Buddy on it, and are inaccessible. The location of each Bob-omb Buddy becomes increasingly difficult to find as Mario progresses through the game. When a cannon has been unlocked, the metal hatch slides away, revealing a square hole in the ground. In order to use the cannon, Mario only needs to drop down into this hole. 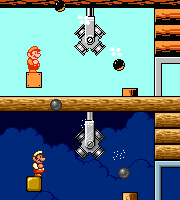 The cannon then rise out of the hole, and the player can use it to fire Mario to previously unreachable areas. When Mario has entered a cannon, a targeting reticle appears on the screen, allowing the player to aim the cannon where they want Mario to go. Once the cannon is locked on target, press the button to fire (or in the remake). The player should aim slightly higher than the area they wish to shoot Mario to, as the height of Mario's trajectory tends to gradually decrease after he is fired from the cannon. Mario will not take fall damage if he is fired from a a cannon. 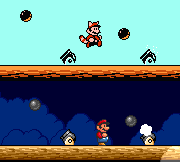 If the player collects a Wing Cap before entering a cannon, the player can fly around as Wing Mario immediately after being fired from the cannon, without needing to perform a Triple Jump to take off first. Cannons cannot be unlocked until after the first mission is completed. There is also a cannon outside Princess Peach's Castle, though it is covered by a small metal grate as opposed to a metal hatch. The cannon can only be unlocked and used after Mario has collected all 120 Power Stars in the game. When used, the player is able to access the roof of Princess Peach's Castle, where Yoshi and a hidden Wing Cap await. For the DS version, if 150 Power Stars are collected, Luigi can capture the green mini-game rabbit from the roof. In the Whomp's Fortress mission "Blast Away the Wall", Mario must shoot himself out of a cannon in order to obliterate the topmost section of a nearby wall, which releases the hidden Power Star. Mario running towards a cannon in Pinna Park with a Sunflower Kid in Super Mario Sunshine. In Super Mario Sunshine, there are very few Cannons, most of which are operated by Monty Moles. These cannons are completely red in color and have three openings from which multiple Bullet Bills, Bull's-Eye Bills, and Gold Bullet Bills can be shot. They effectively take the place of Bill Blasters in this regard. When Mario approaches the cannons, the Monty Moles cease firing Bullet Bills at him, and instead begin pelting Mario with multiple Bob-ombs, which Mario must diffuse (by spraying them) and then throw back at the mole to defeat it. 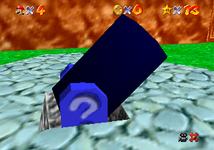 The first cannon that is encountered in this game is found on the upper west side of Delfino Plaza. When Mario first comes across it, a Pianta mechanic working inside it tells Mario that it is unfortunately out of order, and therefore unable to be used at the moment. However, after Shadow Mario has kidnapped Princess Peach and taken her to Pinna Island, the cannon becomes accessible, and Mario is able to use it to shoot himself to Pinna Island to pursue Shadow Mario. From this point on, the cannon continues to act as Mario's only means of transport to Pinna Park, which he must return to every time he wishes to travel there. When Mario enters this cannon, he is automatically shot to the island, without needing to aim first. The second cannon in the game can be found near the entrance to Pinna Park, and is manned by a Monty Mole. In the episode "The Beach Cannon's Secret", Mario must dodge incoming Bullet Bills and make his way to the cannon, where he must throw Bob-ombs at the Monty Mole to defeat it. After it has been defeated, Mario must enter the cannon's opening to complete a Secret Level and return to Delfino Plaza. Mario can also use the Bullet Bills fired from the cannon as an opportunity to collect many Blue Coins, which are hidden under baskets that can only be broken open by Bullet Bills. The third and final cannon in the game is found in Episode 1 of Noki Bay. In this episode, the cannon is positioned atop an extremely large cork, and continuously shoots out Glorpedoes which gradually fall down cliff faces and cause widespread pollution in the area. Mario must make his way to the top area of Noki Bay until he reaches the area with the cannon. Again, he must defuse Bob-ombs and then throw them back at the Monty Mole to defeat it. This time, the entire cannon explodes when defeated, and the cork blocking the waterfall is dislodged, releasing the Shine Sprite for that episode. A Warp Cannon from New Super Mario Bros..
A type of Cannon called a Warp Cannon appears in New Super Mario Bros.. These cannons blast Mario or Luigi to a different world. They are usually unlocked by finding a secret goal in a level. Another type of cannon called Pipe Cannons appear, which, when entered, blast Mario or Luigi to an unreachable place in a level, similar to the slanted pipes from Super Mario World. Cannons reappear in Super Mario Galaxy. These cannons appear to be more advanced than the cannons from Super Mario 64 and they largely fulfill the same role as in that game. They also have much more precise aiming, since the player uses the to aim. The button fires the cannon and Mario or Luigi can get to high places and Power Stars. He is not shot in an arc, however. He keeps going in a straight line and can lose a life if shot out of the gameplay area, as he does not fall down unless he hits a surface. In New Super Mario Bros. Wii, Cannons and mortars from Super Mario Bros. 3 that fire Cannonballs and Bob-ombs re-appear. The rotating sets of four cannons also appear (with a slight redesign), and one of them is larger and fires Giant Cannonballs. This one is usually found at the end of the airship stages before the battle with Bowser Jr., with one of their cannons being a Warp Pipe that doesn't fire and which characters must enter. Warp Cannons and Pipe Cannons from New Super Mario Bros. also appear. Mario aiming at a target with a cannon in Super Mario Galaxy 2. Cannons once again appear in Super Mario Galaxy 2. However, they only appear in Bowser Jr.'s Boom Bunker, where they are mostly used in place of Launch Stars. In the Throwback Galaxy, the cannon from Whomp's Fortress is replaced by a Sling Star. Cannons in these games are pretty much the same as the original, but there's a target to land on. If the hero manages to hit the center, he gets an extra life. Cannons appear in Super Mario 3D Land in several levels, with a similar function to Super Mario 64 and Super Mario Galaxy. However, it can now controlled by moving the Nintendo 3DS around, just like the binoculars. Cannons are also provided by Toad for either Mario or Luigi, and are often found in the level after his Toad House stage. These cannons are used by the heroes to gain access to the airship levels where either Boom Boom or Pom Pom appear to challenge them. The cannons in this game share the same color scheme of that with a black body and blue outlines. Warp Cannons return in New Super Mario Bros. 2, though they act much different than before. In addition to a dark blue color scheme instead of a black color scheme, they gain access to 'Dash Mario' stages, which have Mario or Luigi continuously running through a short Subspace-esque setting dodging enemies and timing jumps to get through the level, with optional Coins to collect which also act as a guide to getting through the level. Collecting a row of coins causes a audience to clap. Completing these stages allows Mario to gain access to other worlds. Pipe Cannons also return from the previous games, acting much in the same way. These pipes first appear in World 1-A. Mortars that fire Bob-ombs also reappear, though they launch them as Parabombs in this game. In New Super Mario Bros. U, Warp Cannons take an important role in Castles. After Mario, Luigi, Yellow Toad, and Blue Toad finish the Castle, they run up a flight of stairs and jump inside the cannon and blast into one of the Koopaling's airship and start the Koopaling battle. Pipe Cannons also appear in levels and in the World Map, the latter of which is used to travel to other worlds. The Cannons from Super Mario Bros. 3 also appear and act in the same way; they appear in The Mighty Cannonship from Soda Jungle as well as in some challenges of Challenge Mode. Cannons also appear in Super Mario 3D World in the Tank levels during cutscenes. They are used at the beginning of the levels near Sprixies to transport the player to the stage. They also appear as enemies. They most prominently appear in World Star-9 (Cosmic Cannon Cluster), and attack like in previous games. If a Brick Block is destroyed under a Cannon, it changes into a Cannon Box, which can be used to attack enemies and destroy cracked walls. Cannons reappear in Super Mario Maker and Super Mario Maker for Nintendo 3DS. They fire Cannonballs once more. The game introduces a red variation that fires red Cannonballs which travel faster. Adding a Super Mushroom makes it larger in size and shoot Giant Cannonballs. Unlike Bill Blasters, items and enemies cannot be place inside a cannon, therefore it can only shoot cannonballs. They can be defeated by big Goomba's Shoes. In Super Mario Run, cannons are timed to fire cannonballs at specific moments during their on-screen duration. This careful timing can be used to gain height from the air when playing Airship levels (2-4, 4-4, 6-3). They spawn in single sets, but also double and triples, giving players more space to bounce off of when facing a barrage of cannonballs. In Donkey Kong for the Game Boy, cannons appear in a variety of forms. Their appearance changes from level to level. In the Desert, the canons have a dated look taken from the Middle Ages (top image). They fire out bullets that look like Bullet Bills. If Mario gets hit by one, he gets killed. On the Airplane, cannons are made out of steel and look more contemporary, but their basic function is unchanged (middle image). In later airship levels, some cannons can change their angle of fire, shooting diagonally and upwards (as seen in the bottom image). A Cannon from Mario vs. Donkey Kong 2: March of the Minis. Mario vs. Donkey Kong 2: March of the Minis/Mario vs. Donkey Kong: Minis March Again! Cannons later appear in boss fights against Donkey Kong in Mario vs. Donkey Kong 2: March of the Minis and its sequel Mario vs. Donkey Kong: Minis March Again!. To use them, the player must use the stylus to move the handle to aim. To fire, the player must tap the "Shoot" button. Cannons appear as common objects in the game, first appearing in Cannon Cove as the main object. They also appear as the main weapon against the final boss, like in the previous games. There are two types: Multidirectional Estatic Cannons and cannons that aim in a only direction, with the latter moving vertically or horizontally. Cannons reappear in Mario vs. Donkey Kong: Tipping Stars, where they act the same as in their previous appearance. Cannon Kongs, Kong toys with cannons for bodies, also appear. 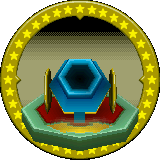 Although no regular, harmful cannons appear in the game, Pot Cannons make an appearance as the first helpful cannons of the Mario series in Super Mario RPG: Legend of the Seven Stars. They appear in Land's End and help Mario to reach higher places. Bowser asking Mario and Luigi to let him out of the Cannon in Mario & Luigi: Superstar Saga. A cannon also appears in Mario & Luigi: Superstar Saga. After the crash of the Koopa Cruiser, Bowser gets stuck in it, and tells Mario and Luigi to get him out. They can not, however. Tolstar then tells them that he will help them get Bowser out if they collect 100 Beanbean coins. The Mario Bros. obtain the coins, but Tolstar betrays them. Mario and Luigi then defeat Tolstar in a battle, but Sergeant Starshade comes out and lights the fuse of the cannon, sending Bowser to crash into Hoohoo Mountain. The Cannon then disappears, allowing Mario and Luigi to pass. Cannon items appear in Mario & Luigi: Partners in Time. They are named Cannonballers, and are one of the many Bros. Items in the game. A cannon called Grande Boom appears in Paper Mario: The Thousand-Year Door, in the Fahr Outpost area. This cannon is vital for Mario in the game. He has to use it in order to shoot himself up to the Moon. The cannon itself is big enough that it can fit more than 100 Bob-ombs inside of it. The Bob-ombs are needed to fire the cannon off. Cannons appear in Paper Mario: Color Splash on the Toad Captain's ship. Mario must use the cannons to fire Cannonballs in order to get through the Violet Passage. Cannons appear in Yoshi Topsy-Turvy. 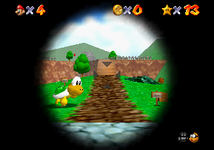 Yoshi can go inside one by jumping at its top, and by tilting the Game Boy Advance to the left or the right, the cannon tilts to the respective direction. In Mario Pinball Land, Cannons blast Mario to other areas. To access the Cannon in The Fun Fair, Mario must hit and then roll into it to choose a location the player wishes to go to. Cannons as seen in Mario Party 4. In Mario Party 4 for the GameCube, four cannons appear in the 1-vs-3 minigame Hide and Go BOOM!, as the hiding spots of the three players. The fourth player lights the fuse to fire the cannons to send them flying. 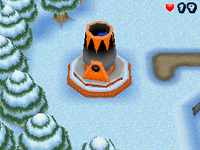 A cannon has appeared in Mario Party 7 as an orb in Pagoda Peak. In Mario Party 8, on the board DK's Treetop Temple, characters can use Cannons to blast to a space somewhere at the top of the map for five coins. On the board Goomba's Booty Boardwalk, Pirate Goombas use Cannons to blast any characters who land on the respective ? Space back to the start. Cannons appear in Mario Party DS. They appear on the board, Bowser's Pinball Machine, where they are scattered on sides of the board. If the player lands on the space next to the cannon, they hop in it. Then they have to draw a line in the direction they want to land. They then land on a bumper that they bounce off of. After they bounce off the bumper, they land on a space. A Cannon also appears as a collectible. It is a board feature from Bowser's Pinball Machine. The figure can be unlocked by being launched by a cannon on Bowser's Pinball Machine three times. Cannons also appeared in the Mario Party: Island Tour minigame Cannonball!, where players have to travel the farthest by firing themselves out of the cannon. Smaller Cannons that shot exploding Cannonballs appeared in Mario Hoops 3-on-3's Pirate Ship court. In Wario: Master of Disguise a golden cannon known as Blamses was a popular attraction. Another cannon in Master of Disguise is the Sphinx Jr., and another cannon known by K9 Cannon. A Cannon in Mario & Sonic at the Olympic Winter Games. During the Adventure Tour of the DS version in Mario & Sonic at the Olympic Winter Games, cannons are used to launch Mario or Sonic to a different island after they saved a Snow Spirit. Cannons as seen in the Mario Sports Mix party game Bob-omb Dodge. Cannons make an appearance in the Mario Sports Mix party game Bob-omb Dodge where players get to dodge the Bob-ombs that are shot out for two minutes. Also in the game, players can use Warp Cannons in the Flower Cup Tournament to unlock alternate routes. Cannons appear in Captain Toad: Treasure Tracker, uses for Captain Toad and Toadette to reach areas in various levels. A new type of cannon called Turnip Cannon, is introduced in the game. Cannons make their return in Mario + Rabbids Kingdom Battle, albeit redesigned to resemble Rabbids. They launch Mario and company to another part of the map, where goodies can be found. Blue cannons launch Mario and company to a bonus area where all Blue Coins must be collected to gain a new weapon. Large cannons send Mario and company to their respective worlds. In the game Mario is Missing!, Luigi had to return the ammunition of a cannon (the Emperor's Cannon) to the Kremlin. In Super Princess Peach, Kaboombas, which appeared in Super Mario World 2: Yoshi's Island, were named "Cannons". ↑ Hodgson, David S J, Bryan Stratton, and Stephen Stratton. Super Mario Sunshine Prima Official Strategy Guide. Page 13. ↑ Super Mario 64 Japanese instruction booklet, page 18.